To Cite: Saberi E A, Farhad Mollashahi N, Soltani S, Salimi Khorashad A, Ghasemi A. Comparative Evaluation of Common Intracanal Medicaments, Teucrium Polium L and Teucrium Polium L with Calcium Hydroxide: An In Vitro Study, Dent Clin Exp J. 2017 ; 3(1):e9383. doi: 10.5812/dcej.9383. Background: Use of different intracanal medicaments and irrigating solutions is an essential step in root canal treatment to decrease microbial count. Some medicinal plants have antimicrobial properties. This study sought to assess and compare the antimicrobial effects of aqueous extract of Teucrium polium (TP) with and without calcium hydroxide (CH) on Pseudomonas aeruginosa, Enterococcus faecalis, Staphylococcus epidermidis and Staphylococcus saprophyticus in comparison with Chlorhexidine (CHX). Methods: In this in vitro experimental study, the antimicrobial efficacy of TP alone and in combination with CH was evaluated by disc diffusion and whole plate diffusion methods. The diameter of inhibition zones was measured by a ruler. Data was analyzed with one-way analysis of variance (ANOVA) and non-parametric Mann Whitney and Kruskal Wallis tests (SPSS version: 16). Results: The TP extract alone had no antibacterial effects after 24 hours of incubation and the mean diameter of the growth inhibition zones was zero. 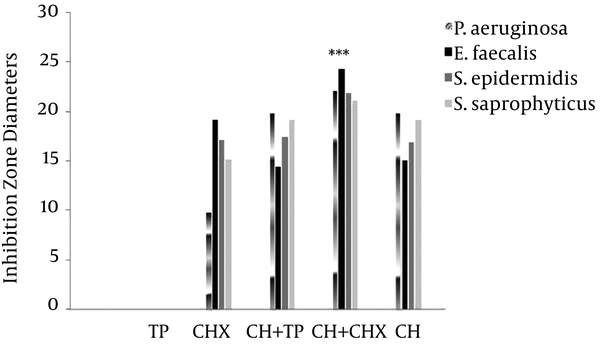 Significant differences were observed in calcium hydroxide plus CHX group in comparison with the other groups in four bacteria (P < 0.001). Conclusions: Calcium hydroxide plus CHX had the highest antibacterial effects compared with other medicaments and the TP extract had no antibacterial effects. Microbial stimulations are mainly responsible for pulpal and periapical diseases, and endodontic treatment is performed to completely eliminate or minimize microbial stimulation (1). Because of the complex anatomy of the root canal system, debridement and cleaning cannot be done efficiently via instrumentation alone, and inadequate mechanical and chemical debridement of the root canal system often leads to endodontic failure and inflammation (2, 3). Evidence shows that successful elimination of microbial pathogens from the root canal system is achieved in 50% of cases of root canal cleaning (1). Thus, effective irrigating solutions and intracanal medicaments must be used to eliminate microorganisms from the root canal system. Calcium hydroxide is commonly used as an intracanal medicament. However, it has some limitations. It cannot efficiently eliminate all the microorganisms from the root canal system (4) and requires a long time (seven days) to exert its antimicrobial effects (5). Moreover, due to high pH, it is potentially toxic and can cause soft tissue damage and subsequent chronic inflammation and necrosis in clinical settings (6). Chlorhexidine gel (2%) is extensively used as a root canal medicament due to suitable antibacterial property, relatively long substantivity, and no toxicity (7). Common side effects of Chlorhexidine are color change and precipitation. When NaOCl and CHX are mixed together an acid-base reaction occurs that forms a precipitate (8, 9). The CHX at different concentrations and in combination with Ca(OH)2 has satisfactory physicochemical properties (pH, radio-opacity and working time) that would allow it to be used as an intracanal medicament (10, 11). The major aim of root canal medicaments is to disinfect the entire root canal system. Use of antimicrobial medicaments is effective in reducing the bacterial load to some extent, yet some bacteria do remain and cause reinfection. With regards to the ineffectiveness, disadvantages and side effects of synthetic drugs, herbal alternatives for endodontic usage might prove to be advantageous. Teucrium polium is among the most widely recognized and consumed medicinal plants worldwide. It is among the most important genera of the Lamiaceae family, which has over 340 genera around the world. It grows in the north, west, south, and center of Iran, Alborz province, around Tehran, and especially in moors and semi-dry mountains. In terms of distribution, Teucrium polium L is most commonly found in the hillsides of Alborz and South Khorasan province (12). Many studies have shown the antioxidant, antidiabetic, anti-hypertension, anti-inflammatory, cholesterol-lowering, and cardiovascular protective effects of TP. Also, the antimicrobial activity of this plant has been previously confirmed (12). In 2000, Essawi and Srour evaluated the antibacterial activity of the aqueous and organic extract of TP against eight bacterial species, using whole-plate diffusion and disc diffusion methods. Their results revealed that both extracts were effective on Gram-negative and Gram-positive bacteria (13). Another study evaluated the antimicrobial activity of the ethanolic extract of TP against different antibiotic-resistant microorganisms and showed that the ethanolic extract of TP had significant antibacterial effects on Gram-positive bacteria, especially staphylococci (12). It appears that the main constituents of TP, such as essential oils, particularly thymol, flavonoids, tri-terpenoids, and free hydroxyl radicals, have significant antimicrobial and antibacterial properties and are mainly responsible for the antimicrobial activity of TP (13). Since the antibacterial activity of TP against gram-negative and gram-positive bacteria, especially E. faecalis, S. epidermidis, S. saprophyticus and P. aeruginosa, has not been specifically evaluated, this study sought to assess the antimicrobial efficacy of aqueous extract TP, calcium hydroxide mixed with aqueous extract of TP and common intracanal medicaments against E. faecalis, S. epidermidis, S. saprophyticus and P. aeruginosa. This efficacy is evaluated by the disc diffusion and the whole plate diffusion methods. The Teucrium polium La leaves were collected from Khash in Sistan and Balouchestan province and their extract was obtained by the maceration technique in Sistan and Balouchestan University. Distilled water was used as the solvent. For this purpose, 100 g of TP powder was precisely weighed by a digital scale. To prepare the aqueous extract, 500 mL of distilled water was added and the mixture was vortexed for 72 hours at room temperature to obtain the extract. The mixture was then filtered using Whatman filter papers and the wastes were discarded. The initial extracts were obtained as such and centrifuged at 3000rpm for 10 minutes. The overlaying solution was then collected and transferred to a vacuum distillation apparatus for solvent evaporation. After one hour at 80°C, the solvent was evaporated and the concentrated extract was collected. After drying, the dried extract was UV-sterilized. To ensure sterilization, the extracts were cultured on nutrient agar (Merck, Darmstadt, Germany). The extracts were stored in sterile dark containers at 4°C until the experiment. To determine the weight of aqueous TP extract, a test tube was weighed and 1 mL of the aqueous extract was transferred to this test tube. The content of the tube was then dried at room temperature and after drying, it was weighed again. The difference in weight of the tube equaled 1 mL of the extract. Measurements were made in triplicates and the mean of the three values was calculated as the weight of dry extract. Standard strains of P. aeruginosa (ATCC 27853) Gram-negative and E. faecalis (ATCC 29212), S. epidermidis (ATCC 12228) and S. saprophyticus (ATCC 15305) Gram-positive bacteria were obtained. The culture media (Merck, Darmstadt, Germany) were used for culture and storage of bacteria. Mueller Hinton agar and Mueller Hinton broth (Merck, Darmstadt, Germany) were used for this study. To prepare microbial suspension, Mueller Hinton agar culture medium was inoculated with the bacteria using a sterile swab 24 hours prior to the experiment. Microbial suspension was prepared using Ringer’s solution after culturing the bacteria on the agar plate. The turbidity of the suspension was determined using a spectrophotometer (SP80016C, Taiwan (at 530 nm wavelength and diluted to reach a 0.5-McFarland concentration of 1.5 × 108 colony forming units/mL, using Ringer’s solution. To determine the susceptibility of the bacterial strains, the Kirby-Bauer disc diffusion test and the whole plate diffusion technique were used. Paper discs were used for assessment of the antibacterial activity of the extract. In the disc diffusion method, the agar plate was inoculated with 1.5 × 108 colony forming units/mL (equal to 0.5McFarland standard) concentration of the standard culture. Discs dipped in 10, 20, 30, and 40 mg/mL concentrations of the extract were placed and slightly compressed on the culture medium using a sterile hemostat. The plates were then incubated at 37°C for 24 hours. To assess the antimicrobial activity of CH powder plus TP extract and CH powder plus CHX (2%), the CH powder was mixed with the extract, saline or CHX to obtain creamy pastes with a weight/volume ratio of 1:1.5. Pastes were placed in wells created in agar culture medium by a sterile Pasteur’s pipette. The plates were then incubated at 37°C for 24 hours. Antimicrobial activity was assessed by measuring the diameter of the growth inhibition zone in millimeters (ruler). To increase accuracy, all tests were repeated in triplicates. Also, a disc containing microorganisms without any medicament/irrigating solution was considered as the positive control and a plate without bacteria was considered as the negative control. In the entire plate diffusion test, 0.2 g of the aqueous extract was added to 5 mL of sterile distilled water and vortexed; 1 mL of the solution was added to a sterile Petri dish. Sterile Mueller Hinton agar (Merck, Darmstadt, Germany) culture medium was also added to the Petri dishes. One loop of standard culture of each microorganism was cultured on the media and incubated at 37°C for 24 hours. Each test was repeated in triplicates and the mean values were analyzed with one-way analysis of variance (ANOVA) and non-parametric Mann Whitney and Kruskal Wallis tests. The SPSS software was used for data analyses (SPSS version: 16). For multiple comparisons of the mean values, Duncan’s new multiple range test was applied at P ≤ 0.05 level of significance. The antimicrobial effects of TP and other materials are presented in Figure 1. The results showed that TP had no antibacterial effect at 24 hours after incubation and the mean diameter of the growth inhibition zones was zero. According to the Kruskal Wallis test, the mean diameter of the growth inhibition zone was significantly different among the study groups (P < 0.001). Pairwise comparisons by the Mann Whitney test with Bonferroni adjustment revealed significant differences between the groups. Significant differences were observed in calcium hydroxide plus CHX group in comparison with the other groups in four bacteria (P < 0.001). Figure 1. Comparison of the mean diameter of the growth inhibition zones among the four bacteria exposed to five different combinations of medicaments/irrigating solutions/extract. *** P < 0.001 comparison with other groups in four bacteria. Assessment of the antimicrobial activity of the aqueous extract of TP showed that it had no inhibitory effect on P. aeruginosa, E. faecalis, S. epidermidis and saprophyticus. However, combination of aqueous extract of TP and CH inhibited the bacterial growth almost favorably, which may be due to the presence of CH. This finding is in contrast with the results of most previous studies. Tabatabaie Yazdi in 2013 reported that aqueous and ethanolic extract of TP inhibited S. epidermidis yet had no significant effect on P. aeruginosa (14). Bakkali et al. in their study in 2008 on essential oils extracted from TP showed that δ-cadinene, D-Limonene, and β-caryophyllene in the composition of extract had antimicrobial effects (15). Also, Chedia et al., in 2013 showed that phenolic compounds and flavonoids in the composition of TP significantly inhibited the growth and proliferation of Gram-positive and Gram-negative bacteria (16). However, the current findings did not confirm the antimicrobial activity of TP. Some other studies have reported poor antimicrobial activity of TP as well. Mosadegh et al. showed that ethanolic extract of TP had poor antibacterial effects on staphylococci, Micrococcus luteus and Escherichia coli (17). Moreover, Oganesyan reported that TP had weak antibacterial effects on staphylococci (18). Controversy in the results of studies is probably attributed to the different types of extract and differences in the composition of the soil, in which the plant grows. Further studies are required on different types of extracts to find the constituents with the highest effect on bacteria. Different materials are used for cleaning the root canal system. A suitable material for this purpose must have adequately high antimicrobial activity and minimal destructive/toxic effects. Several materials have been tested for this purpose. Calcium hydroxide and CHX are effectively used for root canal cleaning. The current study showed that CH had almost similar effects on all four types of bacteria yet had lower effects on E. faecalis, which shows its resistance to CH. Awawdeh et al., in 2009 confirmed this finding (19). Sjorgren et al., in 1991 reported that CH must be applied to the canal for seven days in order to exert antimicrobial effects (5). Saberi et al. showed that the antimicrobial activity of CH increased over time and reached statistical significance from day three onwards (20). On the other hand, inefficacy of CH has been shown in vitro yet the situation might not be the same in clinical settings (20). Chlorhexidine had significantly different effects on the four types of bacteria in the current study and showed the highest effect on S. epidermidis and the lowest on P. aeruginosa. These results are different from those of previous reports. do Amorim et al. in 2004 reported the lowest minimum inhibitory concentration of CHX for E. coli, Prevotella denticola and E. faecalis, respectively (21). Also, the antimicrobial efficacy of CHX against different bacteria has been previously confirmed (8, 22). However, the concentration of CHX may affect its efficacy against different bacteria (8). The effects of CH plus CHX were the same on P. aeruginosa, S. epidermidis and S. saprophyticus, yet it had maximum effects on E. faecalis. Moreover, the current results showed that CHX had a more favorable antibacterial efficacy compared to CH and their combination. It has been suggested that inhibitory and synergetic effects of dentin on this combination should be evaluated in future studies. Regarding the limitations of this study, the results showed that the aqueous extract of TP did not inhibit bacterial growth and its combination with other agents did not boost their antimicrobial efficacy. However, considering the controversy in this respect, future studies are warranted. The authors would like to thank Sistan and Balouchestan University of Medical Sciences for providing the extract. 1. Hasheminiya SM, Havaee SA, Rajabi M. [Antibacterial and substantivity evaluation of 2.5% sodium hypochlorite, 0.2% cholorhexidine and distilled water as root canal irrigants (In - vitro)]. J Islamic Dent Assoc Iran. 2005;17(5):38-45. Persian. 2. Bidar M, Zarei M, Abbasian M. [Comparison of Chlorhexidine and Sodium Hypochlorite Effect as Intracanal Irrigants on Pain and Swelling after Root Canal Therapy in Teeth with Necrotic Pulp]. J Mashhad Dental School. 2007;31(3):163-70. Persian. 3. Grossman LI, Meiman BW. Solution of pulp tissue by chemical agents. J Am Dent Assoc. 1941;28(2):223-5. doi: 10.14219/jada.archive.1941.0060. 4. de Souza CA, Teles RP, Souto R, Chaves MA, Colombo AP. Endodontic therapy associated with calcium hydroxide as an intracanal dressing: microbiologic evaluation by the checkerboard DNA-DNA hybridization technique. J Endod. 2005;31(2):79-83. [PubMed: 15671813]. 5. Sjogren U, Figdor D, Spangberg L, Sundqvist G. The antimicrobial effect of calcium hydroxide as a short-term intracanal dressing. Int Endod J. 1991;24(3):119-25. [PubMed: 1778624]. 6. Ferreira CM, da Silva Rosa OP, Torres SA, Ferreira FB, Bernardinelli N. Activity of endodontic antibacterial agents against selected anaerobic bacteria. Braz Dent J. 2002;13(2):118-22. [PubMed: 12238802]. 7. Chitsazi M, Shirmohammadi A, Balayi E. Effect of herbal and chemical mouth-rinses on periodontal indices; comparison of matrica, persica and chlorhexidine. Shiraz Uni Med Sci. 2008;8(4):54-60. 8. Estrela C, Ribeiro RG, Estrela CR, Pecora JD, Sousa-Neto MD. Antimicrobial effect of 2% sodium hypochlorite and 2% chlorhexidine tested by different methods. Braz Dent J. 2003;14(1):58-62. [PubMed: 12656467]. 9. Yaghootikhorasani M, Assar S, Rezahoseini O. [Comparison of antimicrobial effects of persica® and chlorhexidine with sodium hypochlorite on enterococcus fecalis and candida albicans: An in vitro study]. J Mashhad Dental School. 2010;34(2):153-60. Persian. 10. Prabhakar J, Senthilkumar M, Priya MS, Mahalakshmi K, Sehgal PK, Sukumaran VG. Evaluation of antimicrobial efficacy of herbal alternatives (Triphala and green tea polyphenols), MTAD, and 5% sodium hypochlorite against Enterococcus faecalis biofilm formed on tooth substrate: an in vitro study. J Endod. 2010;36(1):83-6. doi: 10.1016/j.joen.2009.09.040. [PubMed: 20003940]. 11. Samadi N, Zaree R, Bakhtiar H, Salehnia A, Azimi S. Comparative antibacterial efficacy of endemic satureja khuzistanica jamzad essential oil, sodium hypochlorite and chlorhexidine gluconate solutions as root canal irrigations. Dent Res J (Isfahan). 2011;8(1):28-32. [PubMed: 22132012]. [PubMed Central: PMC3177378]. 12. Bahramikia S, Yazdanparast R. Phytochemistry and medicinal properties of Teucrium polium L. (Lamiaceae). Phytother Res. 2012;26(11):1581-93. doi: 10.1002/ptr.4617. [PubMed: 22344867]. 13. Roukia H, Mahfoud HM, Ould El Hadj MD. Chemical composition and antioxidant and antimicrobial activities of the essential oil from Teucrium polium geyrii (Labiatae). J Med Plant Res. 2013;7(20):1506-10. 14. Tabatabaei Yazdi F, Alizadeh Behbahani B. Antimicrobial effect of aqueous and ethanolic extracts teucrium polium l. on streptococcus pyogenes, pseudomonas aeruginosa and staphylococcus epidermidis. Scientific J Biol Sci. 2013;2(3):54-61. 15. Bakkali F, Averbeck S, Averbeck D, Idaomar M. Biological effects of essential oils--a review. Food Chem Toxicol. 2008;46(2):446-75. doi: 10.1016/j.fct.2007.09.106. [PubMed: 17996351]. 16. Chedia A, Hanene Ghazghazi H, Hasnaoui Brahim H, Abderrazak M. Secondary metabolite, antioxidant and antibacterial activities of teucrium polium l methanolic extract. Intl J Agron Plant Prod. 2013;4(8):1790-7. 17. Mosadegh M, Dehmoubed Sharifabadi A, Nasiri P, Esmaeili S, Naghibi F. [The study of phytochemical, antifungal and antibacterial effects of teucrium polium and cichourium intybus]. Scientific J Kurdistan Uni Med Sci. 2002;7(1):1-6. Persian. 18. Oganesyan GB, Galstyan AM, Mnatsakanyan VA, Shashkov AS, Agababyan PV. Phenylpropanoid glycosides of Teucrium polium. Chem Nat Compd. 1991;27(5):556-9. doi: 10.1007/bf00630353. 19. Awawdeh L, Al-Beitawi M, Hammad M. Effectiveness of propolis and calcium hydroxide as a short-term intracanal medicament against Enterococcus faecalis: a laboratory study. Aust Endod J. 2009;35(2):52-8. doi: 10.1111/j.1747-4477.2008.00125.x. [PubMed: 19703075]. 20. Saberi EA, Farhad-Molashahi N, Mohammadi M. [Antimicrobial evaluation of gutta-percha point containing calcium hydroxide and calcium hydroxide paste in infected root canal]. Zahedan J ResMed Sci. 2010;12(2):13-7. Persian. 21. do Amorim CV, Aun CE, Mayer MP. Susceptibility of some oral microorganisms to chlorhexidine and paramonochlorophenol. Braz Oral Res. 2004;18(3):242-6. [PubMed: 15619879]. 22. Thomas L, Russell AD, Maillard JY. Antimicrobial activity of chlorhexidine diacetate and benzalkonium chloride against Pseudomonas aeruginosa and its response to biocide residues. J Appl Microbiol. 2005;98(3):533-43. doi: 10.1111/j.1365-2672.2004.02402.x. [PubMed: 15715855].